Once you have specified all the needed parameters in the RAID recovery parameters window and clicked the Start button from there, ReclaiMe Pro starts to recover your RAID configuration and displays information about the current found configuration and progress. The first indicator in this section shows how many samples have been already processed. Sample size is calculated by dividing the size of the smallest disk by 1000. The total number of samples is 1000, but the analysis may be completed earlier. The second indicator reflects the average time ReclaiMe Pro spent to process one sample. This section contains information about the current recovered RAID configuration, namely block size, start offset, and whether delayed parity is used (only for RAID5 and RAID6). Also, you can find information about how many samples the current set of the recovered RAID parameters is stable. The progress bar at the bottom indicates the confidence for the current configuration. There are two Stop buttons at the very bottom of the window. Both return to the Disk list window, but Stop-retutn to setup discards interim results, while Stop-accept partial solution adds the current result (whatever it is) to the disk list under the Reconstructed RAID section. Note that in a RAID5 recovery, the recovered RAID configuration contains as many disks as you provided excluding those being discarded in mirror and hot spare detection, if these options are active. 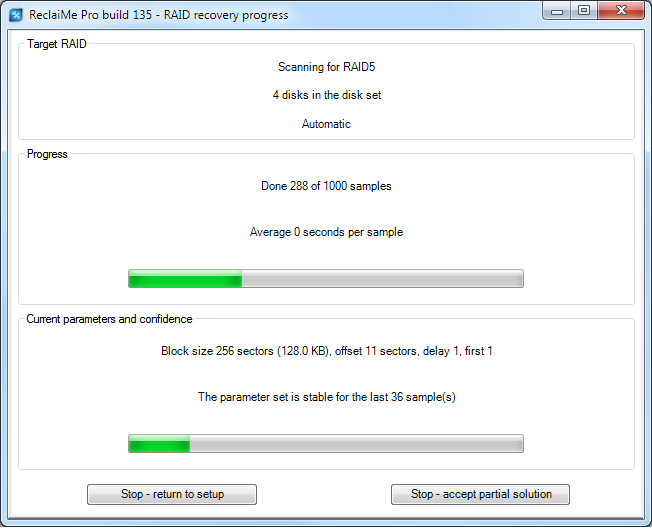 With a RAID10, in the recovered configuration you get half of the disks you specified when starting RAID recovery (if there is no missing disk). In general, one disk from each mirror pair remains. A recovered RAID6 configuration contains as many disks as you provided. A recovered RAID0 configuration might contain fewer disks than you originally specified.